For 2006 Abu have introduced a few new features across the C3 Ambassadeur range. Aside from the cosmetic changes (reshaped side plates, spool, star drag wheel and handle grips, laser etched graphics in place of stickers and the colour of some parts) the reel incorporates the spool release return mechanism introduced a few years ago plus a new centrifugal braking system and Carbon Matrix drag system - which is a vast improvement over the standard washers. Gone is the two block centrifugal brake design and in comes a six-pin captive block design. 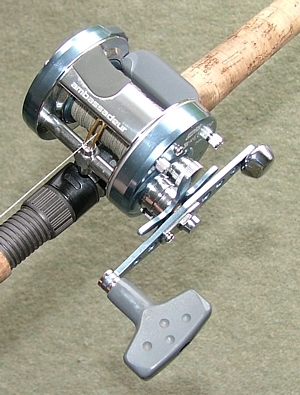 This style has been in common use on other makes of reel for many years and allows the brake to be adjusted without the removal of blocks (as they can be clipped towards the spindle preventing them operating) and providing a wider range of braking power. 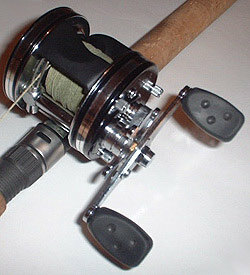 To be extremely picky it is slightly noticeable that the new grips are designed for use on right handed reels and are not very 'ergonomic' when gripped by the finger and thumb of the left hand, but otherwise the reel feels just the same in the hand as its predecessors ever did, and performance in practical terms is not markedly different. Aesthetically it looks 'sharper' and 'cleaner', and for those who rely on the centrifugal brake more than the educated thumb the six-pin brake might be helpful, especially for users of lighter lures. 4601C3 and 5501C3 models also available. Carbon Matrix washers are available as spares from Hatteras. For those who might not be aware 'Record' was the name first applied to Abu multipliers before the classic Ambassadeur was launched in the 1950s. The old Record 'fish' logo is used on the new reel giving a new, high specification Ambassadeur a sort of retro look harking back to the days of high Swedish engineering standards which ABU reels have been deemed to have lost in some circles. The new Record series reels incorporate the changes used in the C3 series plus a few more upgrades. A minor change is the addition of a ball bearing to the levelwind idler gear, but more drastic is the system of bearings used in the spool and spindle. There is now a bearing at each end of the spool spindle - as per the original Ambassadeur design with the dual end caps. The spool itself now has a bearing at the left hand side, but a plain bushing at the right, and a one way (Sensi-Brake) bearing between them, through which the spindle passes. In addition to the above changes the reel features a Thumbar and a flip up metal thumb rest with a rubberised grip over the spool. The thumb rest can only be removed by taking off the right hand side plate and loosening the levelwind - a two minute job. You either love or loathe Thumbars! The High Capacity RCN 61 has the same deep spool as a standard 6501C3 but is supplied as standard with a ported Power Handle. In use I suppose I could probably learn to adapt to coping with the encumbrances around the spool (thumb rest and bar) and found the reel to be a very smooth caster not prone to overruns with lighter lures. A good choice for fishing in-line bucktail type spinners, spinnerbaits and soft baits. Anything that is cranked straight back rather than worked with the rod. I feel that a trick has been missed with the RCN 61HC, unless this is just stage one in producing a high spec classic style Ambassadeur. A dual bearing levelwind would have been a better option than the bearing in the idler to my mind, and a second bearing in the spool in place of the bushing couldn't do any harm. But these are two modifications which can be easily carried out. Is the Record worth the extra 75% over a C3? I'm not convinced. There is also a lower capacity RCN 61 available which has a drilled Vented Spool for lighter weight and a standard dual paddle handle which the other sizes of Record also feature, although they have high speed (6.3:1) gearing. When I heard that Abu were introducing a LHW Ambassadeur to Europe designed specifically for jerkbaiting and featuring stainless steel gearing I have to say I got a little excited. When I found out it was to be 5000 sized and have a thumbar I was dejected. When I discovered it had no Instant Anti Reverse (IAR) I was astounded by such a backwards step. The 5601JB has all the usual 5601 features, including the standard 5.3:1 retrieve speed, with the addition of stainless steel main and pinion gears, and the new style spool release return spring (built in to the pinion gear retainer) - the first time I have seen this in a LHW Ambassadeur. It has no clicker (no problem in a casting reel) and, as already mentioned, no IAR - there is, however, a ball race in place of the one way bearing. Another 'selling point' is the chromed brass handle, but that is hardly an innovation - the 5601s reviewed below already have these fitted! 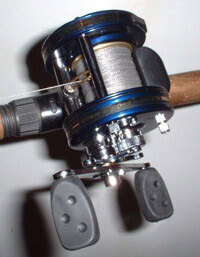 To be honest I can't see what this reel does any better than existing models - and it actually does some things worse. The stainless steel gears may well be long lasting, but the standard brass ones don't exactly wear out in a hurry. As a dedicated jerkbaiting reel I think the 5601JB leaves a lot to be desired - spool capacity is too small for heavy braid, the Thumbar is a nuisance, and the lack of IAR a greater inconvenience when using lure techniques that induce slack line. Considering that all other LHW Ambassadeurs in this size range have IAR the simple way to produce a beefed up jerkbaiting reel would be to stick the stainless gears in a 6501C3 model. All in all a good idea, but badly executed. Update - IAR now fitted as standard. Tim Kelly of the Lure Anglers' Society found this reel on the web at Campbell's Pro Tackle. The 7000 has long had a reputation as a hardworking musky reel that will crank back bucktails day in, day out. Some have said it is a speed machine for 'burning' bucktails at high speed owing to its larger diameter spool compared to a 6000 series Ambassadeur. This certainly gives it more cranking power, so making the retrieving of hard to crank lures much easier. But given that this model has a low gear ratio (4:1) it's actual retrieve speed - in terms of length of line per handle turn - is lower than a standard 6501. I guess the musky guys have been using the faster geared 7500, which will combine the reel's power and ease of cranking with an increased retrieve rate. Obviously the 7001 is heavier than a 6501 and larger in the hand, which might prove a problem for some. Despite the complete lack of bearings in the 7001 (it has bronzed bushings at each end of the spool spindle) it casts well - possibly owing to its old style design, or maybe its larger spool. As there is no bearing on the handle shaft there is no Instant Anti Reverse either. For the cranking techniques this reel is most suited to this isn't a major problem. As a specialist reel for cranking in heavy and/or extremely resistant lures like monster-bladed spinnerbaits the 7001 is going to be a tough act to beat - if you can handle its physical size and weight. The lack of IAR and spool bearings, plus the reel's weight, won't be a big deal if you are a committed troller. In fact the low speed, powerful retrieve will be a positive boon, and the large capacity might also be useful - particularly if you are planning to use leadcore line. Indeed, if I had to recommend a reel for pike trolling these days it would be the 7001 - unless you want a line counter. Should the lack of bearings put you off this reel, you can find out what parts are required and what to do to convert a 7001 to a 7001C3 right here - still no IAR though! Updates - Now available in the UK, as is more recent three bearing, 5.3:1 ratio model - the BG7001HS. I bought this reel purely and simply for fishing jigs. Previously I had been using a 1970's Ambassadeur 5001 for the sole reason that it has a low retrieve speed. However, once you get used to the instant anti-reverse feature found on the latest Ambassadeurs it is difficult to step back in time. Another reason for retiring the old reel was that the star drag operates in the opposite direction to every other Ambassadeur I own. Keeping slack out of the line is important when working jigs too, so the C4W had been in my sights for some time. The only thing putting me off was the thumbar, but I am trying to live with that. 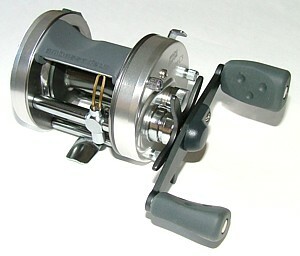 The "W" stand for "winch", which signifies that the reel has a low 3.8:1 retrieve ratio. Just right for jig fishing in my view. 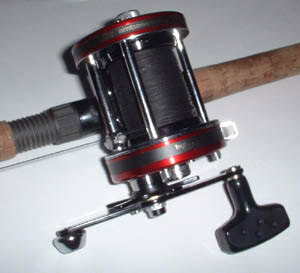 This reel has four bearings, the 'extra' one being in one end of the levelwind. Although I usually fish with 6501 Ambassadeurs the smaller size of this model is not a problem as it is loaded with 65lb Power Pro, and would be equally at home with lighter line still. Admittedly this is a specialised bit of tackle which makes fishing slow and deep with lighter lines a cinch. As far as I know this reel is not available in the UK, so you'll have to get one from the 'States like I did. The C4 series includes fast (6.3:1) retrieve models which some anglers favour for jerkbaiting as they take up the slack easily. Not my cup of tea though.